A document is anything that can be opened, edited, and saved. Whether you are running an existing application or creating a new one, you must always begin by opening a document, such as a VI, and interacting with its contents. The following image highlights the parts of the editor you use to open, access, and interact with a document in a project. Project Files tab—Use this tab to open, create, and organize all the documents within a single project. Document—After you open one or more documents, click one of these tabs to access the associated content. View selector—Click these tabs to access the different parts of a single document. 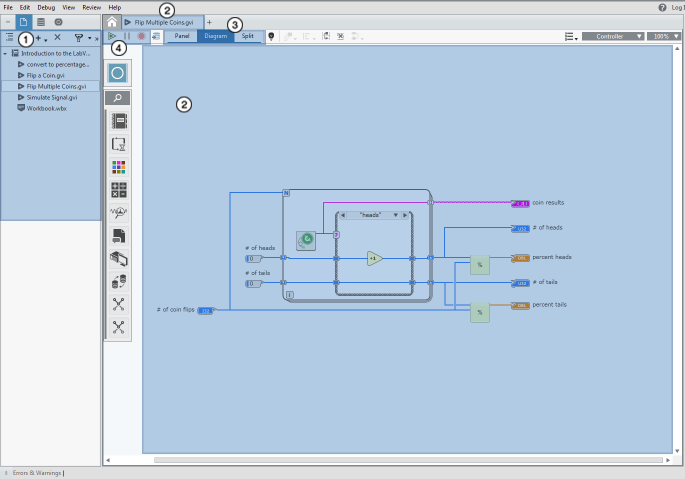 The panel shows the inputs and outputs, the diagram contains the code that runs, and the split view shows the panel and diagram at the same time. Run, pause, and abort buttons—Click these buttons to control the behavior of the code on the diagram. You can see the results of running the code on the panel.